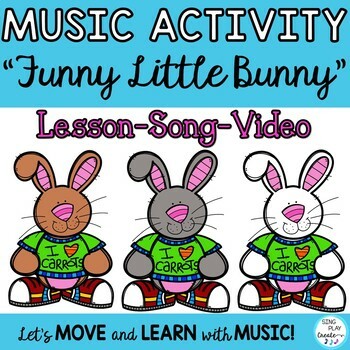 Incorporate movement into your spring themed music classes with “Funny Little Bunny music and movement lesson. Teach rhythms, how to play an Ostinato, while including creating, moving and singing activities. Best for PreK-2nd grade. *Please download the preview for an audio sample. • Video: Use the video as a teaching tool, brain break or sub lesson plan. • Use the PDF File for printing. • Use the Presentation to teach the music concepts. 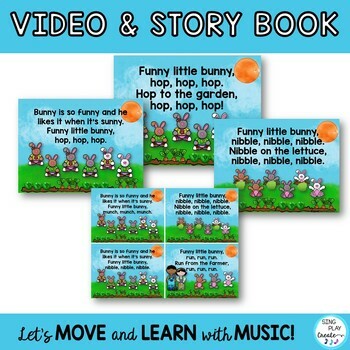 • Use the Song Storybook to teach the lyrics. • Use the game, Dance and Rhythm Lessons over several class times. 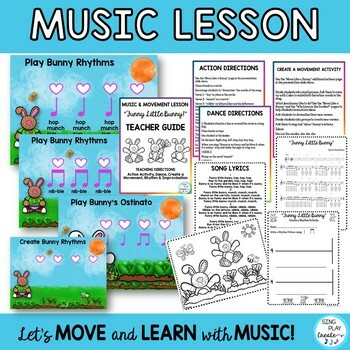 • KINDERS: Use the Actions for a spring music program. 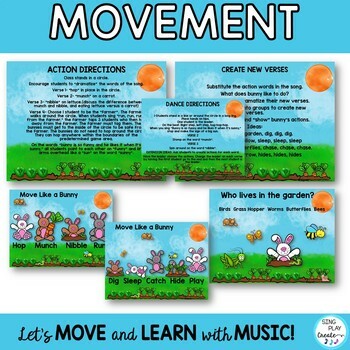 Use it as movement activity paired with spring music lessons. • FIRST GRADE: Use the Rhythm and Rhythmic Ostinato lessons in addition to the other activities. Consider using the Improvisation Activity per student ability. • SECOND GRADE: Use all the other activities and the Create your own actions. Students can work in small groups and present their creations to the class. Use the Improvisation Activity. • Use the Dance as an activity song or reward activity. Use the create new lyrics activity with students as an extension lesson for all grades. Want a Freebie every month? Subscribe to my Website Newsletter.